We lost this game last year. Almost this exact same game. Wisconsin struggled to move the ball in the air. We had a couple of unfortunate, potentially game-changing turnovers. We turned the ball over on a fourth and short. The score uncomfortably close at halftime. Obviously, things went a little better this time. The difference: this game was over the instant Mario Manningham cruised under another deadly accurate 30-yard bomb from Chad Henne. It was 17-10 midway through the third quarter, and that game had ended. That assertion is patently ridiculous when made about a team that never met a fourth-quarter lead it couldn't blow, but it is also true. That game was over. 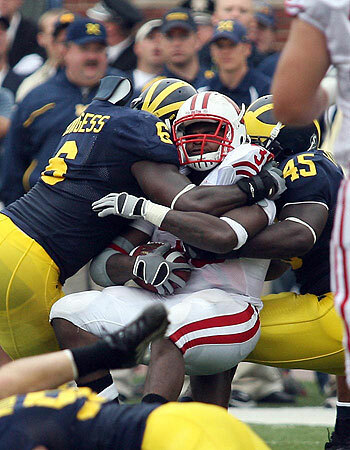 Wisconsin would not move the ball anywhere near Michigan's endzone until it was far too late, and that's what I expected. Where did that come from? Where did the paranoid fear that dominated my psyche at halftime of the ND game when we led by twenty go? Somewhere. I don't know. By the time Michigan officially put the game beyond reach with a short Rivas field goal, Wisconsin had under 150 yards in total offense, 12 of them on the ground. They had gone backwards in the second half. Irritating garbage-time passing against the second string propped up Wisconsin's final numbers and partially obscured the ridiculous dominance of Woodley, Branch, Crable, et al., but make no mistake: this was nearly as beat-down-errific as the Notre Dame game, except in this game Michigan won going away with a -2 in the turnover margin column* instead of a +4. Replay this game 100 times and the average margin of victory for Michigan is closer to 24 than 14. And thus severe cognitive dissonance in the Michigan fanbase. Stung by the Year of Infinite Pain and previous Years of Unnecessary But Thankfully Finite Pain, there is a hestiancy to predict anything better than 10-2, to envision horrible losses to teams with no business on the same field as Michigan (I'm looking at you, Penn State), to prepare for the inevitable hammer blow to the chest courtesy a wacky punt formation or foolish confidence in a slim lead or the plain bloody-mindedness of the universe. We hesitate. We don't want to go through that again. And yet... this team is not last year's team. The Henne-Manningham connection gives this offense a big play element it lacked last year and allows Henne to show off the laser-guided deep ball that won Braylon Edwards the Belitnikoff. Mike Hart is, like, playing. The defense has been nearly impregnable when it matters, giving up the odd touchdown here and there when someone blows an assignment but otherwise mercilessly crushing any and all resistance. The terrifying reality is this is not a 9-3 team. It's not a 10-2 team. And while the harsh axioms of probability conspire against the possibility of an undefeated team, that still-dim chance grows stronger with every sack, every graceful Manningham touchdown, and every four yards Mike Hart creates out of nothing. In 1997 we played Notre Dame, and I watched Michigan turn the ball over around midfield three times. We were trying to follow the horrible script Michigan fans know and loathe so well: late lead, late turnover, late loss. We tried it three times, but one stop became two became three and we wandered off the field, victors. Something changed in there. Faith spontaneously generated itself like maggots in meat. Self-protective cynicsm departed. At some point on Saturday -- probably when Stocco was getting crushed or Hill was getting crushed or Manningham was gliding under touchdowns or Steve Breaston was dancing through Wisconsin coverage like he was a part of the Michael Jackson halftime show -- I gave up. You win, winged helmets. Lucy, I am ready to kick the football.